Cook and learn together with Mommy and Me Start Cooking. Full of fun activities such as experiencing food with all five senses, designing dishes, and performing kitchen experiments, plus an introduction to measurements associated with cooking, this is the perfect cookbook for children who want to join their parents in the kitchen. Readers will learn about staple ingredients such as eggs, flour, and chocolate. They will find out what is inside an egg, where vegetables grow, how flour is made, and more. Mommy and Me Start Cooking will educate and entertain, and is a fun way for families to spend time together. I wanted to get the book, Mommy and Me Start Cooking, for my daughter, Bridget, who has an expressed interest in helping me in the kitchen. She enjoys helping me make recipes and often asks if I can let her make her own. 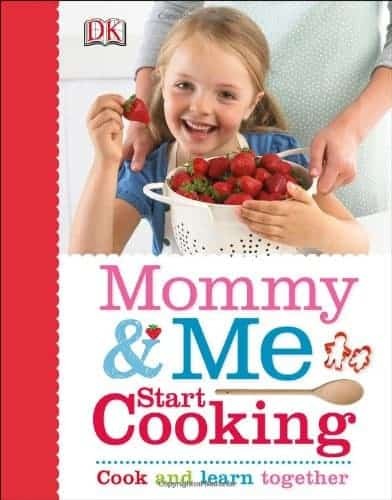 Mommy & Me Start Cooking is the perfect way for a budding beginner to learn to cook. Mommy and Me Start Cooking teaches the basics about popular ingredients. Your child will also learn about ingredients like flour, eggs, pasta, rice and more and how to use the ingredient in a recipe. The book opens with a section on Health and Safety. Some of the tips include don’t lick your fingers after you’ve worked with food and check the use-by date on the ingredients. Most importantly, it says to ask an adult to take things in and out of the oven and to use the stove. Bridget liked that the book was full of pictures and illustrations. It’s also laid out in a child-friendly way to make it easy to read and absorb the information. I even found the tidbits of information interesting. Did you know that a chicken can lay up to 259 eggs in one year? For the recipes, it shows pictures of the ingredients along with the measurements and step-by-step instructions with pictures. Some examples of recipes include Blueberry Cake, Pasta Bake, Pita Pizzas, Pea Hummus and more. Bridget is a picky eater, but is more likely to try something (and eat it), if she’s made it herself. She’s off to a great start with Mommy and Me Start Cooking and it’s also a fun way for us to have some mother-daughter bonding time. Check out the other books featured in DK Canada’s Summer Fun Boutique on for 30% off for a limited time only. Awesome book! I used to love cooking with mommy as a kid. a fabulous book, a great addition to the kitchen. I cooked a lot with my mum and though it was a bind when I had to cook our Sunday lunch I did learn an awful lot from her. Her strawberry shortcake is loved by one and all. I have heard good things about this book, I am thinking of picking up a copy for a Christmas present this year. Great book! I’m just starting to teach my daughters to cook and I’m sure they would love this. This would be an excellent gift to give to my daughter and granddaughter, since she is starting to be at that age where she wants to be in the kitchen, mind you she can’t do to much yet but she could help with simple stirring and what not, thanks for the great review! DK Publishing makes some really cute books, and this looks like one of them. My grandkids would enjoy it. My grandson has always loved helping in the kitchen. He has learned he can make “Alphabet Soup” by himself so he wants to often. Great for bonding and learning, cooking together takes patience but is worth it. I loved cooking with my girls and now I love cooking with at least one of my grandkids! This book sounds perfect for us both to learn from! This sounds like a great book, definitely something I would purchase, it makes cooking and learning fun. Thank you for sharing this review. We have this recipe and have made a number of recipes from it. My girls have had a lot of fun with it. This book will create more fun memories in the kitchen! Great book for my daughter to check out. Great little book! Love that it has those little bits of info to learn from. I would love to purchase this book. The time I spend cooking with my niece has been a lot of fun for both of us! She has really been proud of herself after making a yummy dessert! Really lovely review! I would totally purchase this book for my daughters and I. Lovely! Sounds like a very informative and fun book. Sounds like a great book for my granddaughter and I.